Prepare to be amazed by the imposing sights of the U.S. Capitol, the Supreme Court and the Library of Congress. Take some time to visit each of these iconic buildings and stop in at the visitor’s center to learn more. Guided tours are available in each of the buildings daily. If you decide to take one, allow yourself at least two hours to take it all in. Hop off to see the Jefferson Memorial, the George Mason Memorial and take a pleasant stroll around the Tidal Basin. If you’re lucky, the famous cherry trees will be in bloom. Take a half an hour to rent a paddleboat for a relaxing ride in the water. Give yourself an hour to an hour and a half to see everything before getting on the next trolley. Two important sites to see at this stop are the FDR Memorial and the Martin Luther King Jr. Memorial. Allow at least an hour to explore these two memorials and then continue on the trolley to the next stop. Plan to spend an hour seeing the Lincoln Memorial, Vietnam Veterans Memorial, Korean War Memorial and World War II Memorial. Also, if you’re interested, the shuttle to Arlington National Cemetery leaves from this stop. This is the final resting place of America’s fallen war heroes and more than 300,000 people who gave their life for their country. You can take the shuttle to Arlington National Cemetery and then return to this stop to catch the next trolley. A visit to Washington, DC is not complete without a stop at the Washington Monument. 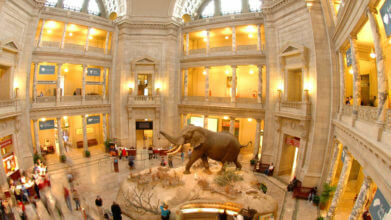 Hop off the trolley here to see it and to visit the Smithsonian Museum of American History. Get off here to take a tour of Smithsonian’s Museum of Natural History. If you really want to see everything from the Hope Diamond to the millions of pieces that represent the history of the natural world, you’ll need much more than a few hours. If you’re pressed for time, see everything you can in 90 minutes and move on to the next attraction.